A lightweight commercial grade vapor steam cleaner! After testing the Ladybug XL2300 vapor steam cleaner on a wide range of tasks, we gave this unit a 5 star rating for its superb performance, reliability and durability when used for light commercial applications or every day residential duties. We like the convenience of chemical free continuous steam because lengthy tasks can be done without having to depressurize the machine before refilling it. Superior to the Ladybug 2200S and Ladybug 2150, the Ladybug XL2300 reaches higher steam temperatures, has more robust wiring to prevent overheating, works for longer periods before running out of steam and has onboard tools. Simply put, this is a high-quality machine for someone who wants to clean for several hours a day. Below are just some of the outstanding results when we put the Ladybug XL2300 to the test. We have successfully steam cleaned the deposits and stains from anything from pets to coffee in carpets and upholstery. Steam cleaning them wrinkles out of clothing, sheets or freshening up stale smelling clothing works well with the triangular brush. 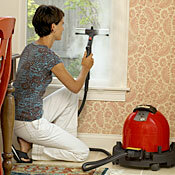 Steam cleaners really come into their own when cleaning and sanitizing hard surfaces. The Ladybug XL2300 can whip through the cleaning of tile floors, kitchen counters, bathroom floors and toilets (the bathroom never smelled so fresh). We have steam cleaned golf clubs, garden patio furniture, our couches and chairs and even tennis courts with no problem. Added weight and width make the Ladybug XL2300 steam cleaners slightly awkward on stairs and narrow corridors. Whether it is grout cleaning, marble floors, sanitizing kitchens and bathrooms, stain removal, the Ladybug XL2300 goes to the top of the class. We found the tools to be of excellent quality and make all the difference with the effectiveness and ease of the cleaning process. Plus, the user can really learn how to use this steam cleaner all throughout the home to its fullest because of its wonderful instructional DVD and quick application cheat sheet that is included. It does command a hefty price tag, but if you are serious about chemical free cleaning, this steam cleaner will not disappoint. In addition, unlike some other manufacturers, we are confident in the after sales support and service as well as the longevity of the Ladybug manufacturer.